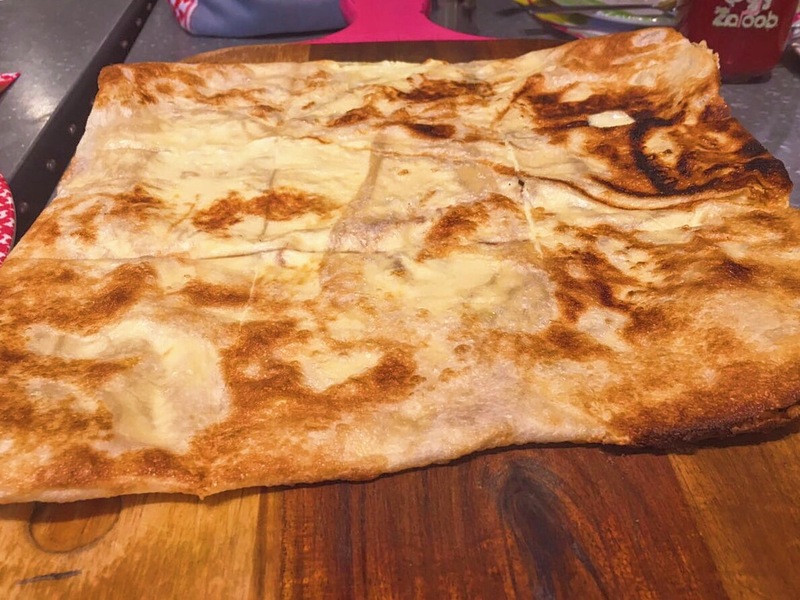 I will be straight forward for once, Zaroob is the perfect place to have some of the best Levant street food. Not only, you will be eating delicious food but also enjoying the street like ambiance with buzzing atmosphere, colourful graffiti walls and furniture and bright lights hanging around! After witnessing how crazy crowded it was, our expectations exploded. Also, I shall warn you, we already had a table waiting for us or else we would have had to wait for another half an hour or more. 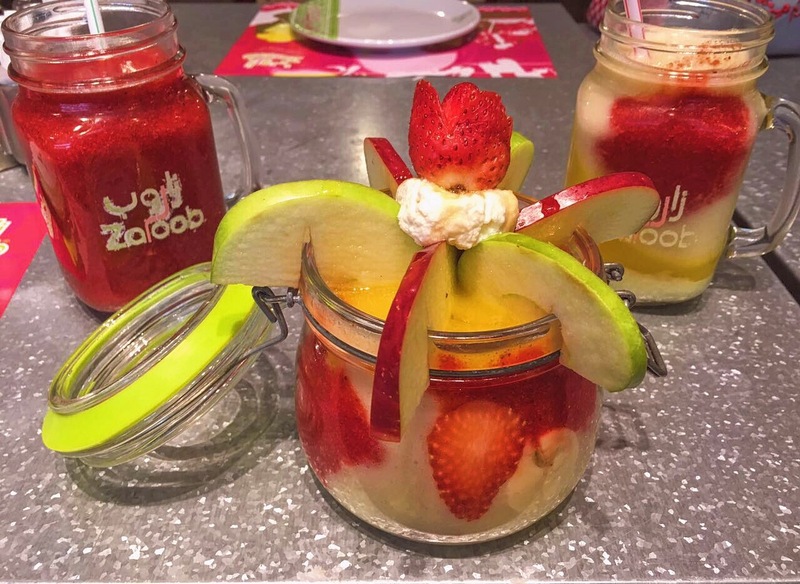 Zaroob is offering a 5 course set menu for only AED 59! (Now this is when you seal the deal). The ordinary, classic tangy flavor. 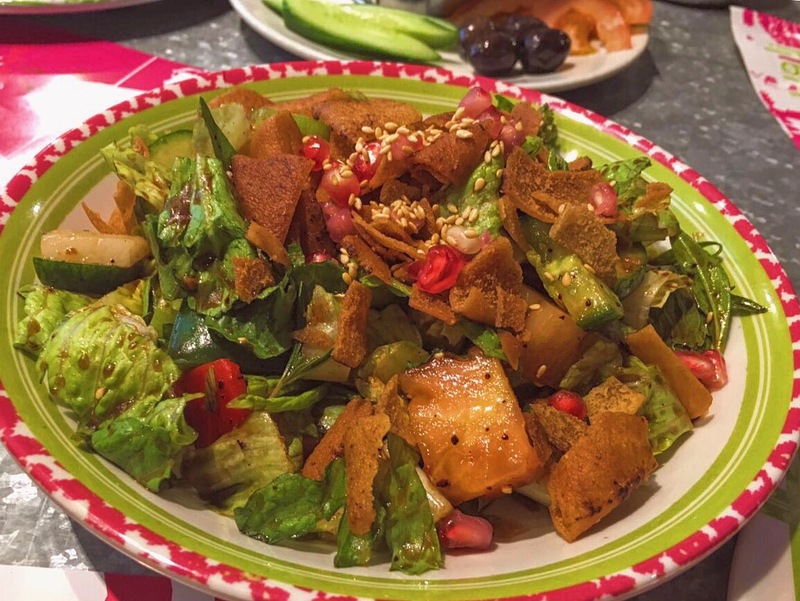 Ingredients include, lettuce, radish, cucumber, bell pepper, tomato cubes, summac powder , fattoush sauce, sesame seeds, fried Arabic bread and pomegranate seeds. A delicious Kraft cheese pastry with flavors that will melt in your mouth! So great to snack on! I had more than I should while talking and waiting for our tea. 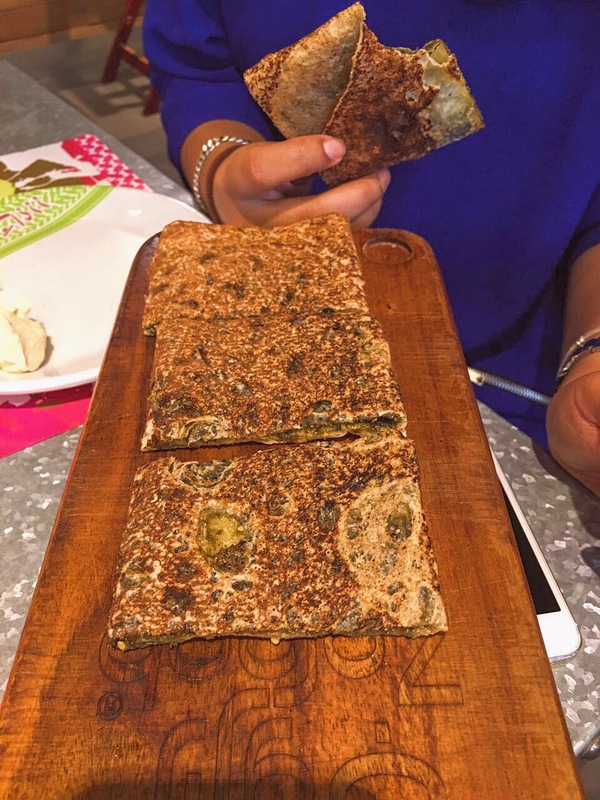 Creamy and tasty yet healthy pea dip, best to have it with complimentary pita bread. 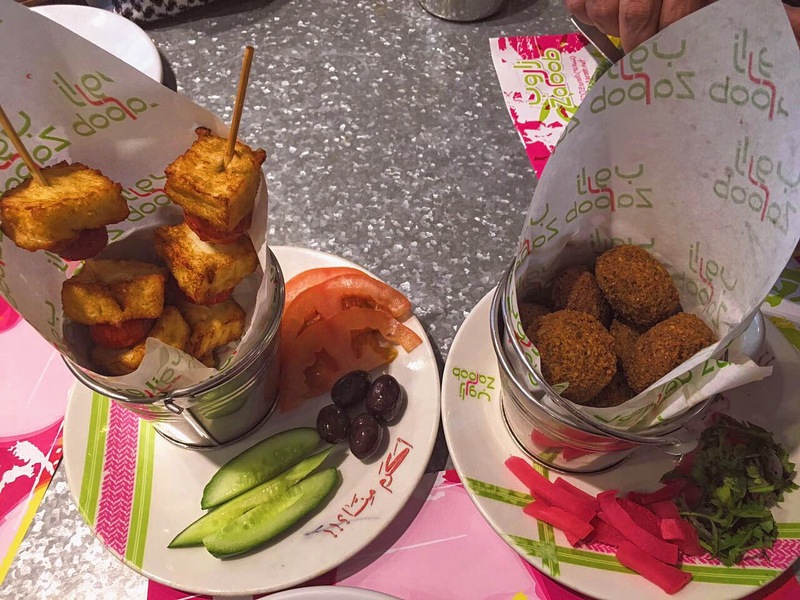 Falafel- Crispy, fried, but soft on the inside with pouring flavor goodness. Halloumi –A golden brown firm, slightly springy textured white cheese skewers with mellow and salty flavor along with the roasted cherry tomatoes and few other veggies on the plate! 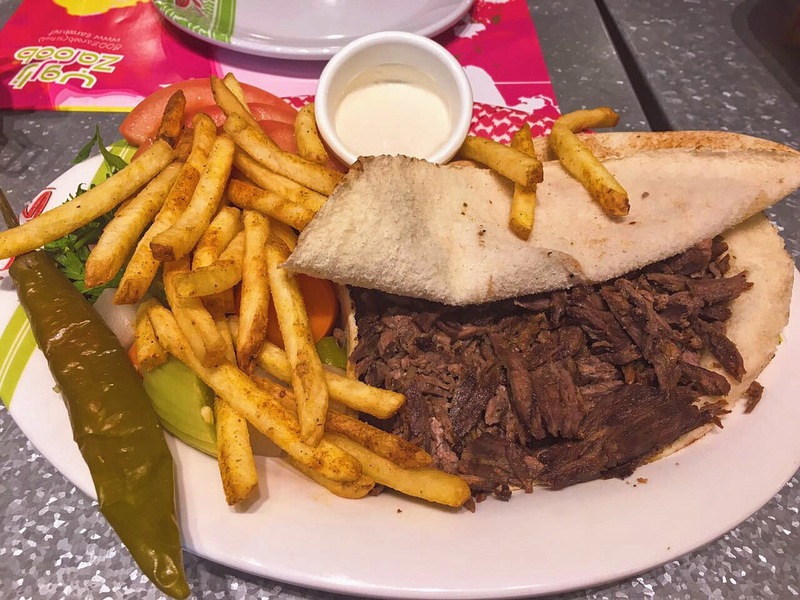 A plate with tempting shawarma beef pieces resting on the pita bread along with tahini sauce and french fries. Well-roasted, tender and delicious. It is definitely rave-worthy but I personally feel like a warped shawarma would have tasted better. Freshly baked Saj with Nutella overload and banana. If you like Nutella and Saj, you are good to have this! Sweet, crispy and simply a treat for all the Nutella lovers out there, including me! Refresh yourself with variety of fresh juices and fruit cocktails! This big jar of juice with pieces of sweet fruits inside was the work of heavens! Absolutely loved the 2 in 1 concept! A fact, Mint tea is a big deal in Morocco as it’s a sign of hospitality, friendship, and tradition! It is very refreshing and definitely made us feel better after so much food. Thank you Zaroob (huge shout out to the manager for great services and letting us know all the information) and rest of the team!